Sully's owner, Shelly, took some liberty with the old Sammy Davis Jr. song (written by Roy Clark) and wrote this about her "Sully Man"
and makes my world go round..."
"What a goof, he makes me laugh so much and might keep you singing tonight !" Sully (Kasomor’s New Monster Shoes), formerly known as Bill, moved to his new home in Saskatoon, Saskatchewan on August 24, 2010 to live with Shelly Campbell, Mark Antonini and two new toller "brothers", Rogan and Finn. He grew quickly and adorned himself in a beautiful coat of golden hair with his appearance strongly resembling a small (dancing) cinnamon bear! 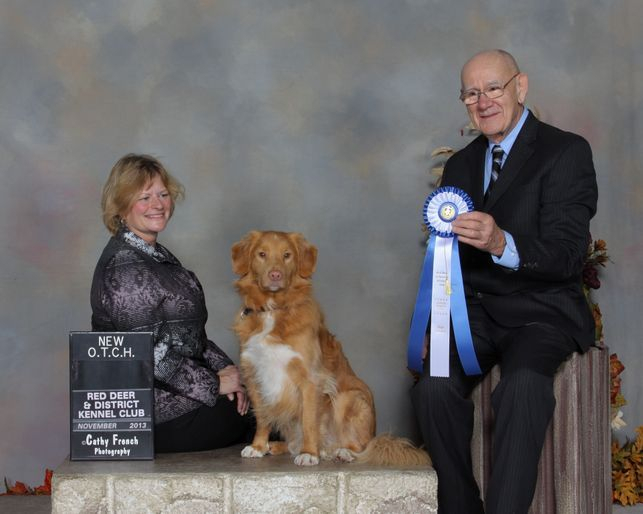 In 2011, we traveled to Calgary for the Nova Scotia Duck Tolling Retriever Club of Canada’s National Specialty Show. At just over a year of age, Sully entered his first-ever Novice Obedience class and qualified on the first day of competitive venues. The following day he was entered in and qualified for his Working Certificate Title and on the last day of the specialty he finished a wonderful weekend by receiving a High In Class Score in the Rally Novice Class. This pass helped to acquire the second of his two titles, WC and RN, with an obedience qualification all in one Specialty weekend! 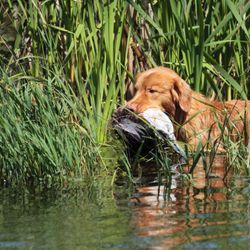 A few months later, after a well-deserved rest, Sully finished his Companion Dog Obedience Title with two HIC scores of 196 and 197.5, which qualified him as the Top Sporting Dog Overall of the Obedience Trials in Prince Albert, winning a nice monetary award. Within three months he was entered in and qualified in his first Open obedience class with a very nice score and within another three months had received his Companion Dog Excellent Obedience Title and his Rally Advanced Title. The summer of 2012 was finished with a Working Certificate Intermediate Title and a Junior Hunt qualifying score. We will be competing in the obedience ring for his Utility Title to complete his Obedience Trial Championship in 2013. We have plans to complete his Rally Excellent Title - if we find the extra time this year - as well as competing in some field events this summer. Sully is an absolute joy to have around, with a loving cuddling side and a very spunky side. Willing to go anywhere for the excitement of what it might bring and smiling the whole time !! He was also thrilled at the addition in 2012 of his new toller "sister", was a great baby-sitter and a patient chew toy. They are best-of-friends and will be traveling together a lot in the near future. 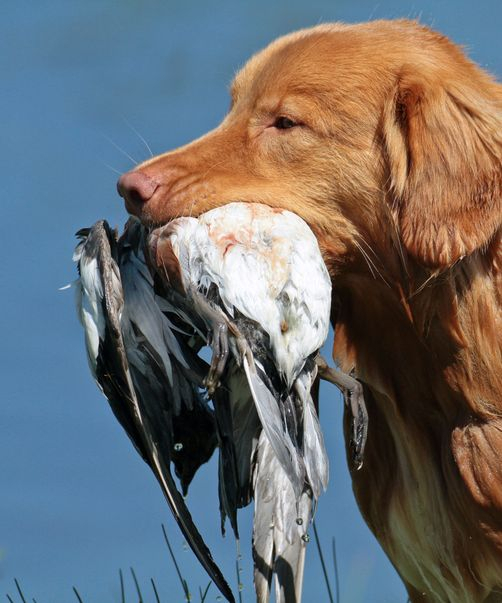 NEWS FLASH **** Sully with Shelly at the other end of the leash, of course, completes his Junior Hunter title!! They also heading in the Utility Dog ring and come away with Sully's first leg!! 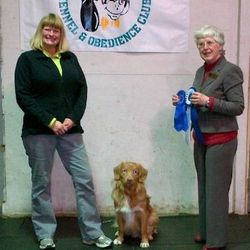 I'm pleased as punch to announce that Sully earned his OBEDIENCE TRIAL CHAMPIONSHIP going High In Class for his final pass in the Utility ring in November, 2013! IT'S A HIGH IN TRIAL! Sully goes HIT from the Open B class for his first MOTCH points the first time in the ring after earning his OTCH! What a good boy!! Sully and Shelly earn his WORKING CERTIFICATE EXCELLENT title in June 2014! Way to go team!! 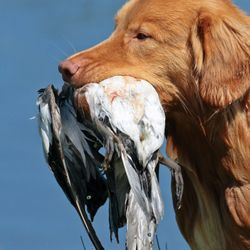 2015 - Sully earns his SENIOR HUNTER TITLE!! 2016 - Shelly and Sully are playing at MASTER!! GO TEAM!! Sully is handled and trained... but most importantly loved by Shelly, in all venues.